NEW PRAGUE, MN (December 1, 2003) - 'Tis the season for glitter, gold, and 'the Gift' of holiday music this December at The O'Neill Brothers' 2003 holiday piano concert. This December, pianists Tim and Ryan O'Neill will be playing and singing on dueling pianos, accompanied by their group of talented guest performers. With a jazz trio and a stage adorned with sparkling gold and velvet red gifts, this show is much more than a simple piano concert. The O'Neill Brothers blend the perfect mix of holiday piano music, songs from their new CD coming this December and of course, their brotherly humor. The tour will begin in St. Cloud, Minn. and travel to St. Peter, Minn., Sheboygan, Wis., Chicago, Ill., Des Moines, Iowa, Omaha, Neb., Sioux Falls, S.D., New Prague, Minn., Eau Claire, Wis., and St. Paul, Minn. Known primarily for their collection of 17 relaxing piano CDs, The O'Neill Brothers show the more upbeat side of themselves on stage. "We love to get the audience to laugh and to interact with us," says Tim. "It's what drives the show." And laugh, they will. Tim and Ryan O'Neill will be singing their own hilarious version of "The 12 Days of Christmas", a tradition they started four years ago in their hometown of New Prague, MN. Last year, they performed a comical duet dressed as Elton John and Beethoven. Who could make rock and roll style and classical music come together? Only The O'Neill Brothers. Using their creative musical talent and fast-acting wit, they interact with each other to make their show truly entertaining. The theme of this year's show is "the Gift". "We love to share the gift of music with others and want each person to realize that they have a unique talent of their own," says Ryan. "This may involve some audience participation!" exclaims Tim O'Neill. Bringing audience members on stage is nothing new to The O'Neill's' show. In the past two years, they have given two lucky audience members trips to Hollywood and New York City, to celebrate the release of their movie themes and Broadway show tunes CDs. This December, they will also launch their "Share the Music" program in the spirit of giving. "'Share the Music' will allow customers to buy CDs on our website for friends or family who need comfort and healing while also benefiting a charity of the customer's choice" says Ryan O'Neill. Proceeds from the Share the Music Program will go to five different national organizations including the National Hospice Foundation, one in which The O'Neill Brothers are actively involved. From playing at an intimate charitable event or performing for George Bush at the Points of Light Foundation in New York City, The O'Neill Brothers maintain a very busy schedule throughout the year. They perform at 50 annual retail and wholesale trade shows each year, maintain a network of more than 1200 gift stores that carry their music, and keep up with their online orders at www.pianobrothers.com. This year, they have also found time to provide music for HBO, ESPN, and NBC television, all through their independently-owned record label. The O'Neill Brothers got their start by individually playing the piano since elementary school, but found the appeal of two brothers playing on two pianos while attending the University of Notre Dame. After their college years, they launched their careers by recording CDs of both familiar songs and original melodies and selling them at their performances and in stores nationwide. After a busy year, Tim and Ryan agree that December is the most fun. "Our travel schedule is so hectic during the year that we do not have as many chances to perform together as we would like. Our December tour gives us the chance to perform together and entertain our fans. It's the highlight of the year!" says Tim. 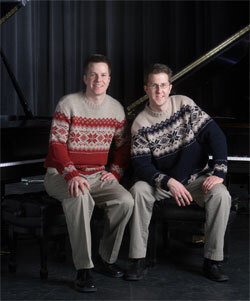 Critics and fans agree that Tim and Ryan O'Neill bring a "refreshing style to piano music" and love the "enthusiasm and charming character" of the two brothers in concert. Mpls/St. Paul Magazine calls it, "The new 'Ferrante & Teicher' show."